The American Physical Society (APS) has named two UConn Physics faculty as APS Fellows. APS Fellowship is a distinct honor signifying recognition by one’s professional peers and is an honor bestowed by election. The criterion for election is exceptional contributions to the physics enterprise; e.g., outstanding physics research, important applications of physics, leadership in or service to physics, or significant contributions to physics education. In 2017, Susanne Yelin and Alex Kovner are named Fellows of the American Physical Society. APS Fellow Susanne Yelin: For pioneering theoretical work with quantum coherences, such as near-resonant nonlinear quantum optics, for work with hybrid systems, such as molecular and solid state materials, and for work with many-body and cooperative systems and super-radiance. 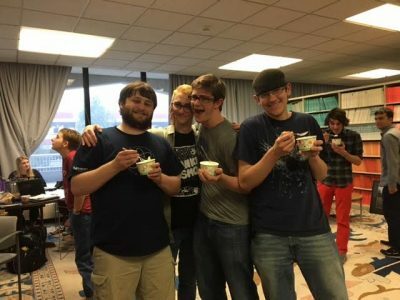 The UConn Physics Graduate Student Association sponsored a social event featuring UConn dairy bar ice cream to welcome back students after the summer break. Other regular events throughout the year sponsored by the PGSA include the Holiday Party in December, the Poster Exhibition Competition in April, and the Department Picnic in May. 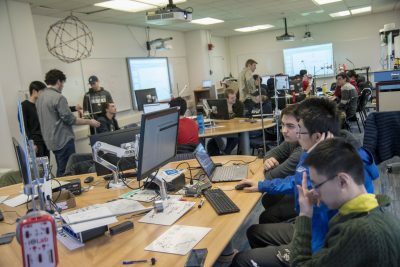 Following up on results from Physics education research conducted at MIT and elsewhere, professor Jason Hancock has begun the process of transforming the way Introductory Physics is taught at the University of Connecticut. Starting with the course PHYS 1601Q for physics majors, Prof. Hancock has developed a curriculum that integrates aspects of both lecture and lab components in an active learning environment that introduces students to all of the essential physics covered in the traditional lecture course, but in a format where students work in groups and discover the principles of classical mechanics for themselves using a hands-on approach. 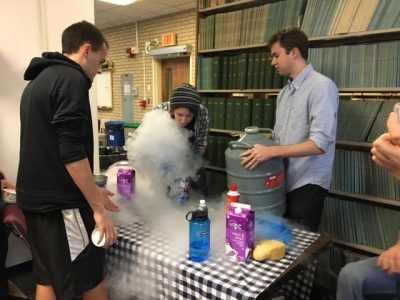 Experience gained with PHYS 1601Q will lay the ground work for the eventual conversion of the full suite of calculus-based Introductory Physics courses into an active learning format. The U.S. Centers for Disease Control lists radon as a primary cause of lung cancer, second only to smoking. The Environmental Protection Agency estimates that 20,000 deaths each year from lung cancer in the U.S. are the result of exposure to radon in the living environment. It is believed that as many as 1 in 15 homes in the continental United States have radon levels that require some form of mitigation. In spite of this, very few homes are equipped with continuous radon monitoring devices and most radiation monitoring facilities only provide feedback on time scales of weeks or even months. The technology used in standard residential radon monitoring has not changed significantly over the past 50 years. On the other hand, development of fast detectors for particle physics experiments at large international laboratories such as the Large Hadron Collider over the past two decades has opened up new technologies for radiation detection that may result in a significant improvement in the efficiency and response time for radon detection. 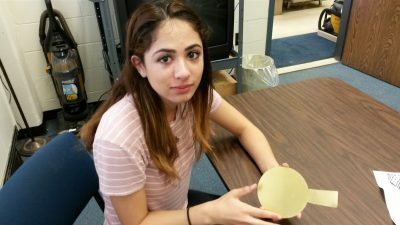 UConn undergraduate Mira Varma, pictured above, is holding a part of what she hopes to assemble into a hand-held radon detector capable of detecting changes in radon concentration on the time scale of an hour, close to the time scale of the natural variation in a residential environment, rather than days or weeks. Mira is carrying out this development under the direction of UConn Physics Prof. Richard Jones. As a research assistant in the physics department at UCONN, I assisted in the alignment, maintenance, and principles of operation of the various apparatuses and measurement techniques used within cold atomic, molecular, and optical (AMO) experimental physics research. This included optical components, laser alignment, laser locking, saturation absorption spectroscopy, and electrodynamic ion trapping. 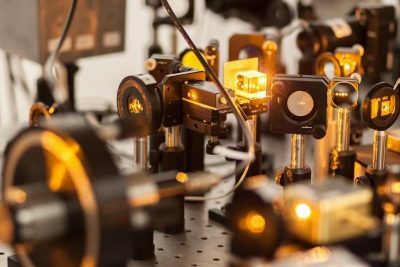 Some specific experiments ran included measuring the fraction of a trapped, sodium atom-cloud (fe) pumped into an optically excited state using laser beams as well as measuring the temperature of a trapped, neutral atom-cloud via spatio-temporal fluorescence imaging. Attached is our record for the Mw 6.9 earthquake associated with eruptions of the Kilauea volcano on the big island of Hawaii. The large waves arriving after 2300 GMT are surface waves (elastic energy that exponentially decays with depth away from the surface) traveling from the earthquake to us. The beating pattern is characteristic of surface waves interfering from slightly different multi paths as they are refracted by the sharp transition in elastic structure between the ocean and continent. The amplitude of strain associated with the waves is on the order of 10**-12 (peak particle velocity divided by propagation velocity). For comparison, the strain associated with gravity waves recorded by LIGO is on the order of 10**-21. Scientists have been rigorously commissioning the experimental equipment to prepare for a new era of nuclear physics experiments. This equipment is at the newly upgraded Continuous Electron Beam Accelerator Facility (CEBAF) at Jefferson Lab in Newport News, Virginia. These activities have already led to the first scientific result. This research demonstrates the feasibility of detecting a potential new form of matter. The result demonstrates the feasibility of detecting hybrid mesons. These mesons are particles that are built of the same stuff as ordinary protons and neutrons: quarks bound together by the “glue” of the strong force. But unlike ordinary mesons, the glue in hybrid mesons behaves differently. The research provides a window into how mesons and other particles that are smaller than atoms are built by the strong force. The study also offers insights into “quark confinement” — why no quark has ever been found alone. 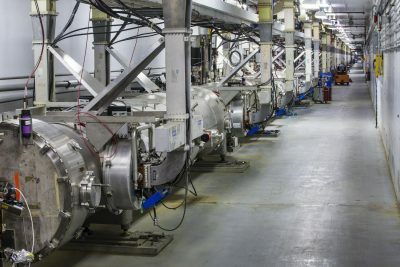 The first experimental result has been published from the newly upgraded Continuous Electron Beam Accelerator Facility (CEBAF). The 12-GeV CEBAF Upgrade is a $338 million, multi-year project to triple CEBAF’s original operational energy for investigating the quark structure of the atom’s nucleus. The upgrade is scheduled for completion in the fall of 2017. This first result demonstrates the feasibility of detecting a potential new form of matter. It comes from the Gluonic Excitations Experiment, which is staged in the new Experimental Hall D that was built as part of the upgrade. GlueX collaborators are working to produce new particles, called hybrid mesons, which are particles in which both the quarks and the strong-force gluons have a role in the structure. Producing and studying the spectrum of these particles will provide nuclear physicists a window to “quark confinement” — why no quark has ever been found alone. Data were collected over a two-week period following equipment commissioning in the spring of 2016. The experiment produced two ordinary mesons called the neutral pion and the eta, and the production mechanisms of these two particles were carefully studied. The data provided powerful new information on meson production mechanisms, ruling out several, and the data also showed that the GlueX experiment can produce timely results. This material is based upon work supported by the U.S. National Science Foundation under grant 1508238. This article first appeared under Science Highlights on the Dept. of Energy web site, October 6, 2017. 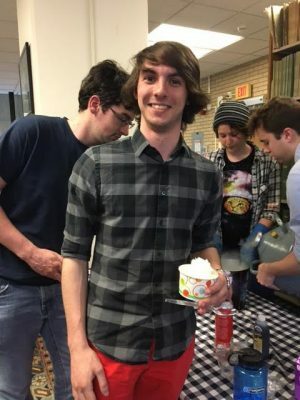 As a theoretical physicist studying the fundamental elements of matter, UConn graduate student Daniel Hoying creates calculations so large and complex they require supercomputers to perform them. So Hoying is obviously excited that he will soon have regular access to one of the world’s most powerful supercomputers at the U.S. Department of Energy’s Brookhaven National Laboratory in Long Island, N.Y. The system is outfitted with Intel’s powerful new Knights Landing Xeon Phi chip. The chip’s 8 billion transistors and other cutting-edge technologies can carry the heavy processing loads that scientists like Hoying need to do their work. 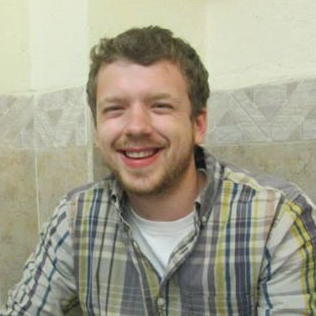 Starting in July, Hoying will spend 12 consecutive months conducting part of his dissertation research at Brookhaven. Only 53 graduate students around the country received SCGSR awards this year. Other winners included students from Yale, Princeton, MIT, Duke, Cornell, CalTech, and Michigan State. 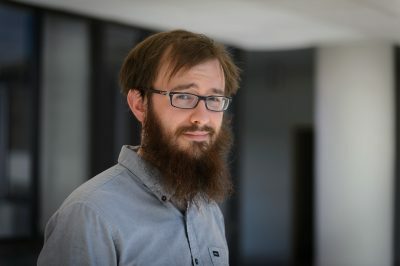 Hoying’s research focuses on the Standard Model of particle physics. The Standard Model explains how the basic building blocks of matter interact and are governed by fundamental forces such as gravity and electromagnetism. It is the most fundamental theory of nature. Hoying specifically studies the strong force in the Standard Model, otherwise known as Quantum Chromodynamics or QCD. The strong force binds fundamental particles of matter together to form larger particles. For example, the strong force helps quarks and gluons combine to make protons and neutrons, which in turn combine to make atoms, which in turn combine to make molecules and so on. He is currently looking at the decaying cycle of particles known as kaons, which decay into two other particles called pions. These extremely small particles, first discovered in cosmic rays, only exist for fractions of a second and have been identified in experiments run in large particle accelerators. They are an essential part of the Standard Model of particle physics. Previous calculations have shown that theory and experiments involving the decay of kaons have differed by small amounts. Hoying’s research aims to reduce those uncertainties, to help scientists learn more about what these particles are and how they behave. Besides increasing understanding and advancing basic science, ultimately the information gathered through Hoying’s research could have a variety of applications in advanced computing and various energy fields. 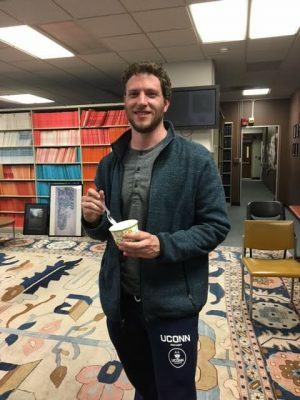 This article by Colin Poitras (UConn Communications) appeared in UConn Today on April 17, 2016.